It has been a while since writing due to many unforeseen circumstances and a few struggles with work etc..However, I hope to keep this as up to date as possible. The chickens are now really growing, the hens seem happy and I now give them a mix of layers mash, chipped corn and a lovely mixture of cereals n seeds. We get their feed from the local cooperativa in Campanet, a village nearby, although I have now discovered I can buy it locally here in Sa Pobla. About a week ago the cockerel began to crow. Whilst lying in bed we heard a very strange crow that began quite well and then ended up sounding like an animal being strangled! We leapt out of bed and went to investigate. There was The Corsican (named by C because - 'course he can') head held high giving it all he had. He needs a little practice but it's great to seem him growing up at last. 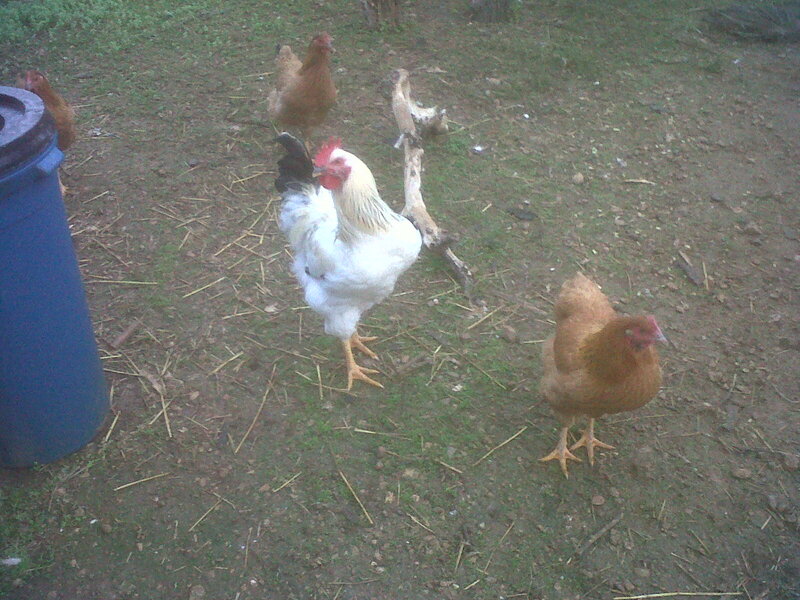 He keeps his 3 ladies in perfect order for now and nobody is pecked too much so all is calm in the coop - for now.